I, frankly, was not impressed with our meals. 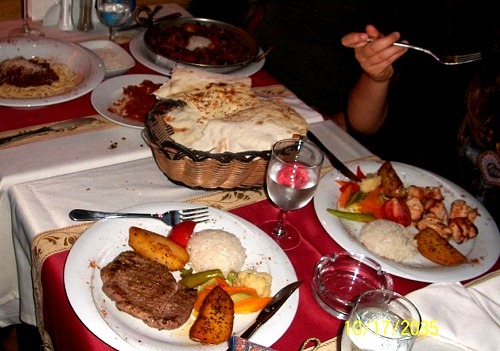 They were simple and repetitive, with staples being tomato, olives, yogurt, egg, lamb and chicken bits or melted cheese on bread, eggplant, hot peppers that were string bean look-alikes, and lots of sweet baklava style desserts. Fruit were limited chiefly to dried apricots and figs. Some chocolate goodies were available, and I had a dandy stuffed type in Foça that was chocolate on both outside and inside, with nuts. (O yum! I came back to the store for another.) 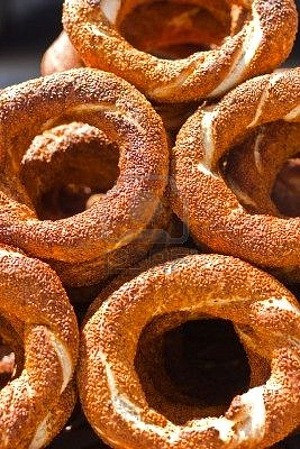 Bread was fair, but some types were good, and a completely covered sesame bagel-like ring, common in the Middle East, was outstanding. I missed leafy lettuces, broccoli, and wine sauces, bananas and fresh soft fruit. 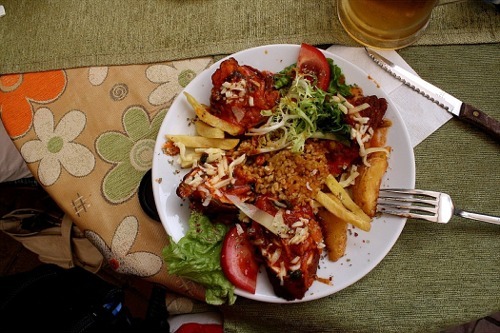 In Foça I had a very tasty preparation of large shrimp. As far as beverages, apple tea was very nice; the Efes beer was a watery pilsner but certainly refreshing on a hot day; locally produced but rare Tuborg Gold was fine bodied; and Raki, a very potent 90 proof anise and raisin liquor, was shockingly good. The first time I had Raki was in the village of carpertmakers; loaded into wine, it changed the flavor and character but got me buzzed quickly. Largely because of reduced exercise and greater consumption of calories than accustomed, I gained five pounds. 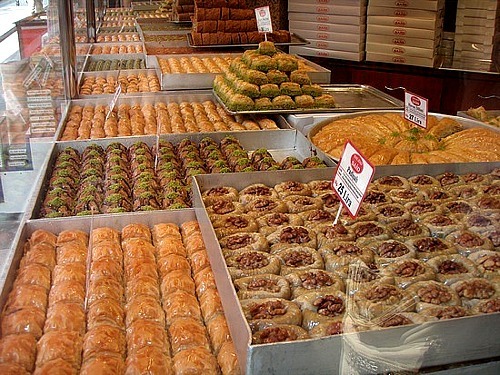 Along the business streets of Istanbul are large displays of baklava. Although there may be various flavorings along with chopped nuts, all may be described as sweet. 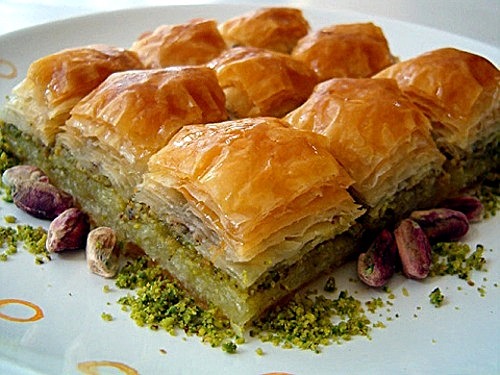 Baklava, with its light but honey-soaked filo pastry layers, is practically synonymous with Turkey, although it is found throughout the Mideast and in Central Asia. 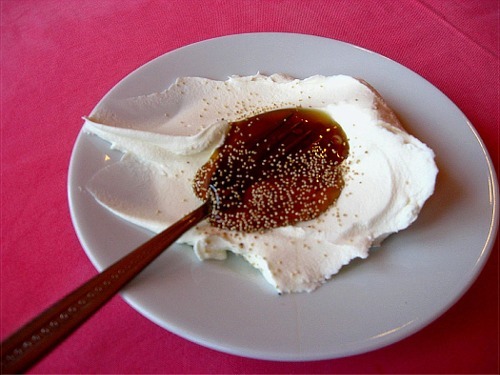 Another confection is based on sesame seed tahini and sugar, halvah, or helva in Turkey. As a child, I ate halvah often. 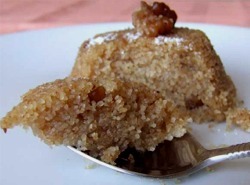 A second variety is of semolina flour, oil, and sugar. Halvah is found in Africa, the Middle East and Central Asia, and in East Europe, via the Balkans. 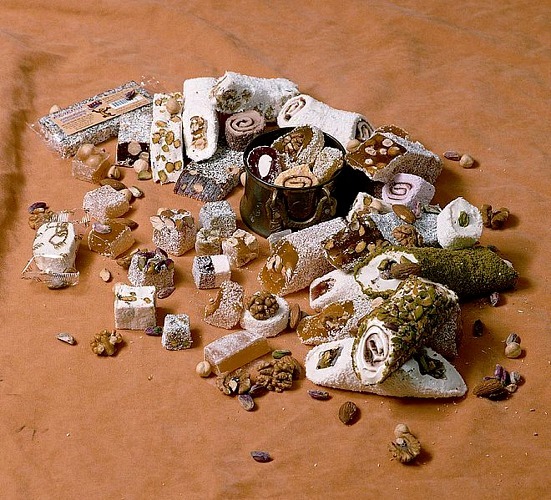 The only time I saw halvah in Turkey was in packages. 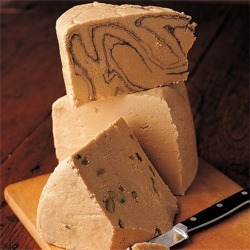 The tahini-based halvah. It has an interesting sticky texture. These bagels were delicious. They were completely covered with sesame seeds and eaten as is. No place for cream cheese and lox. 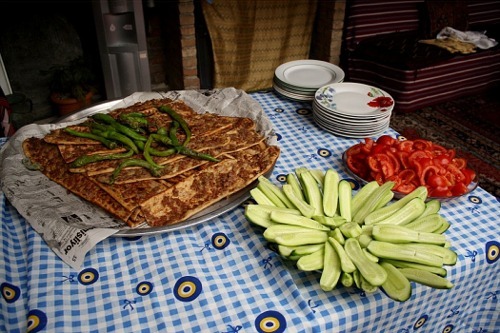 In Konya's Dervish Brothers Center, we were served the Turkish form of pizza with lamb and later cheese, cucumbers, and tomato slices. The long green items are peppers. This is an amazing dish. At a highway stop, we found this specialty that is deceptively simple but extraordinarily tasty and satisfying: yogurt, honey, and poppy seed. The pine forest honey is light and not overly sweet, and the tan poppy seeds, which differ from the black seeds usually found in baked goods in the United States, are more gentle in flavor. They are found in India, Iran, and Turkey. One of our surprisingly good lunches was in the weaving village. The best garbanzos I have ever tasted. 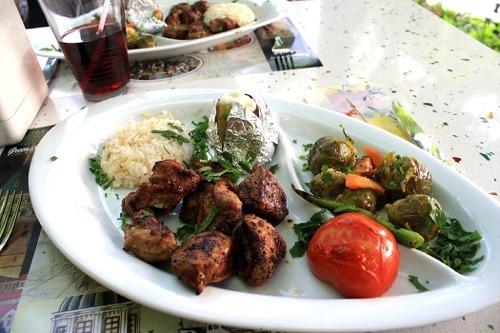 Greens, rice, potatoes, bread, olives with chicken and tomatoes. 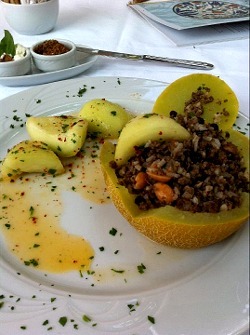 In the café at Green Square near the Hagia Sophia in Istanbul, I ate lamb, rice, Brussels sprouts, tomato, a baked potato, and a pepper. The lamb was seasoned well. An eggplant dish, with potatoes and tomatoes: a satisfying lunch. 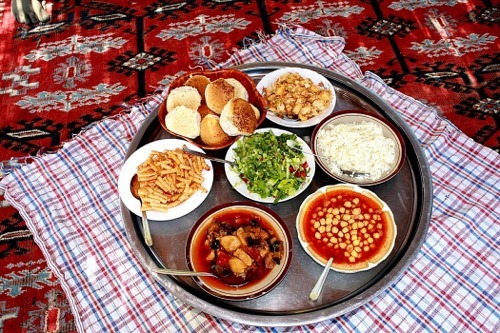 This healthy meal was served at the Rifa'i house in Istanbul. 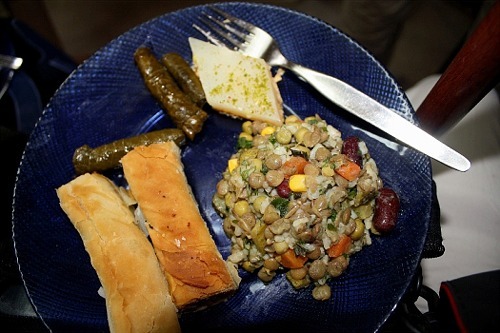 Dolma (meaning stuffed) grape leaves, with a mixture of beans, corn, rice, carrots, and bread. 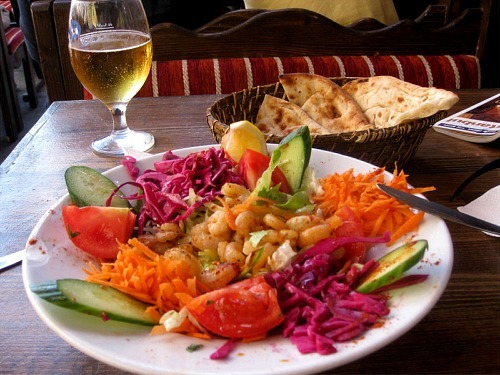 A mixed vegetarian salad: cumbers, tomato, beans, carrots, beets, served with bread and washed down with beer. 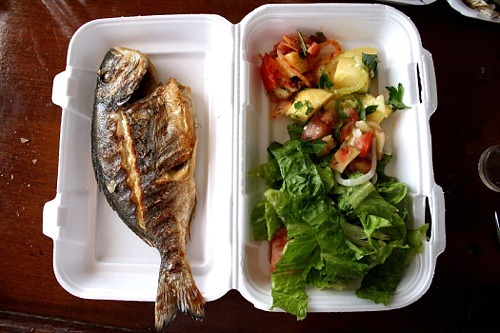 A Bodrum restaurant provided this fish dish. 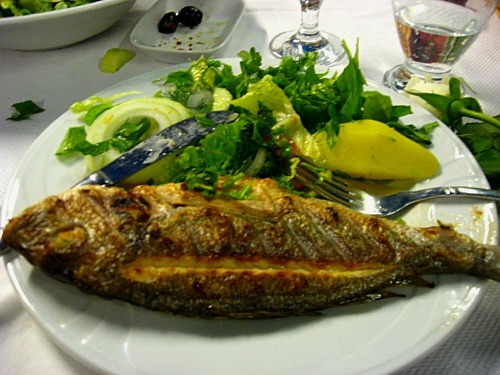 During our boat ride on the Aegean Sea we were served this fish. 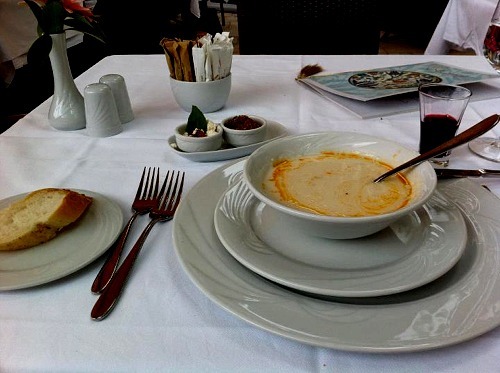 Soup de jour: an atypical lentil soup in Istanbul. 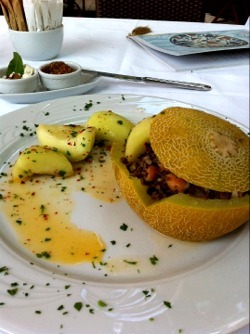 The meat-stuffed melon dish was one of the more unusual meals. A more conventional meal, with a patty of meat (left), chicken (right), pasta (upper left), and the usual rice, tomato, potato, pepper, and carrot. Warm apple tea was a frequent beverage. Refreshing, it was not too sweet and of light density. 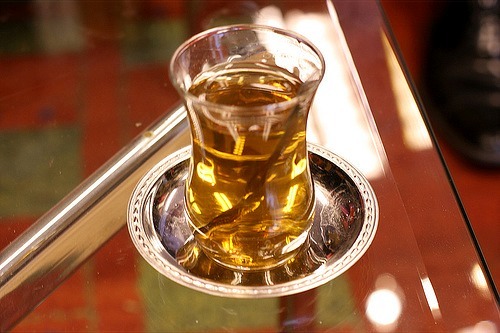 Using the same glassware, Turkish tea is a moderate dark tea; it comes from the Black Sea region. Two alcoholic beverages. 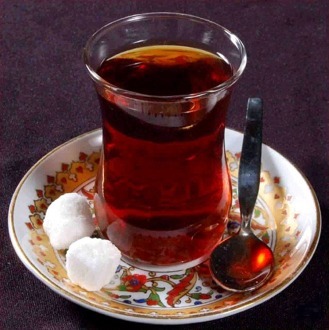 Raki is the national booze of Turkey. When water is added, the solution becomes cloudy. Serve cold. 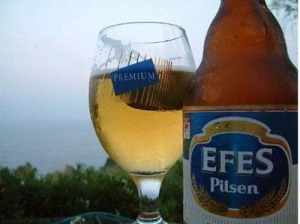 Efes is the ubiquitous beer, a light pilsner. 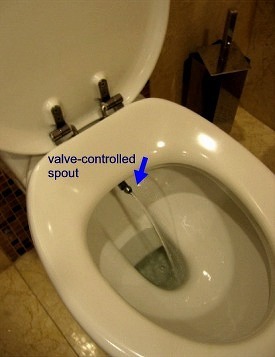 To conclude, while on the subject of food, nutrition, and alimentation, I should mention that Turkish toilets are different by incorporating an internal bidet. Thus, both toilet paper consumption and the blockage of pipes are reduced.